Trump with Saudi dictator Mohammed bin Salman. 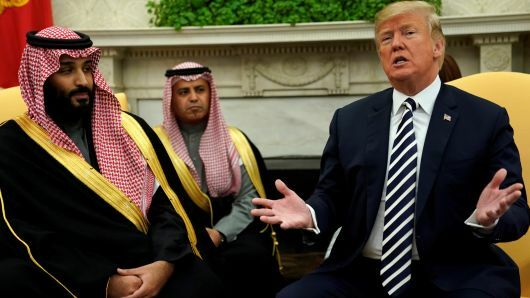 The Trump administration pushed back on Tuesday against rising condemnation of Saudi Arabia and showed support for its crown prince, who has been linked to the disappearance and possible killing of a leading dissident journalist inside a Saudi consulate in Turkey. After days of leaks by Turkish officials that accused Saudi Arabia of sending a hit squad to kill Mr. Khashoggi and dismember him with a bone saw, this was the latest indication that the Trump administration would help the kingdom defuse an international crisis for its top Arab ally. The administration’s moves have come as criticism of Crown Prince Mohammed has intensified — including by Republican members of Congress, business leaders and human rights officials — over Mr. Khashoggi’s disappearance and apparent murder. The reported killing has created a bipartisan uproar in Congress, shaking the foundations of the close American-Saudi relationship with calls for suspension of military sales punctuated by particularly strong rebukes of Crown Prince Mohammed, who basically rules the kingdom for his father. Senator Lindsey Graham, Republican of South Carolina and formerly a strong advocate of Saudi Arabia, has been among the most outspoken critics of the crown prince over the Khashoggi mystery, even before more facts are known. That would undercut any suggestion that Mr. Khashoggi died in a rogue operation unsanctioned by the crown prince. Their connection to him could also make it more difficult for the White House and Congress to accept such an explanation. [I]n the last few days, as major American businesses have withdrawn from a marquee investment conference in Riyadh and members of Congress have stepped up called for sanctions, the United States, Turkey and Saudi Arabia appear to have been searching for a face-saving way out. President Trump floated the possibility on Monday that Mr. Khashoggi was the victim of “rogue killers.” But such explanations would run up against a host of hard-to-explain obstacles. The suspects’ positions in the Saudi government and their links to the crown prince could make it more difficult to absolve him of responsibility. The New York Times has confirmed independently that at least nine of the 15 suspects identified by Turkish authorities worked for the Saudi security services, military or other government ministries. On Monday, when Turkey had already leaked considerable evidence of a hit, Mr. Trump was behaving like a royal apologist. [T]he White House should have been first to suspend participation in a major investment conference in Riyadh next week until the Saudis provided a credible account of Mr. Khashoggi’s fate, rather than leaving it to American media organizations and business executives to take the lead in pulling out. One is certainly left wondering why Trump is so strenuously playing apologist for the Saudi dictators. What are the Saudis holding over him? Or does Trump merely support the murder of journalist who inconveniently report the truth? Something does not add up.